PLYMOUTH MEETING, PA—ECRI Institute, one of the nation's leading patient safety and medical technology research organizations, places health technology cybersecurity at the top of its just-released 2019 Top 10 Health Technology Hazards. The report highlights the potential for hackers to exploit remote access systems to gain unauthorized entry to a healthcare organization's networked devices and systems. Such attacks can disrupt healthcare operations, hindering the delivery of care and putting patients at risk. The full report, accessible to ECRI Institute members, provides detailed steps that organizations can take to prevent adverse incidents at their facilities, not just respond to them. 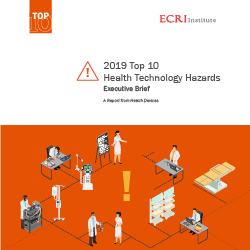 The 2019 Top 10 Health Technology Hazards executive brief is available for complimentary download at www.ecri.org/2019hazards. For questions about ECRI Institute's 2019 health technology hazards or membership programs, call (610) 825-6000, ext. 5891, or e-mail clientservices@ecri.org.